Though Nephi and Lehi both experienced the vision of the tree of life, they explained it and possibly perceived it somewhat differently. They saw the same vision, for Nephi "saw the things which [his] father saw, and the angel of the Lord did make them known unto [him]" (1 Nephi 14:29). 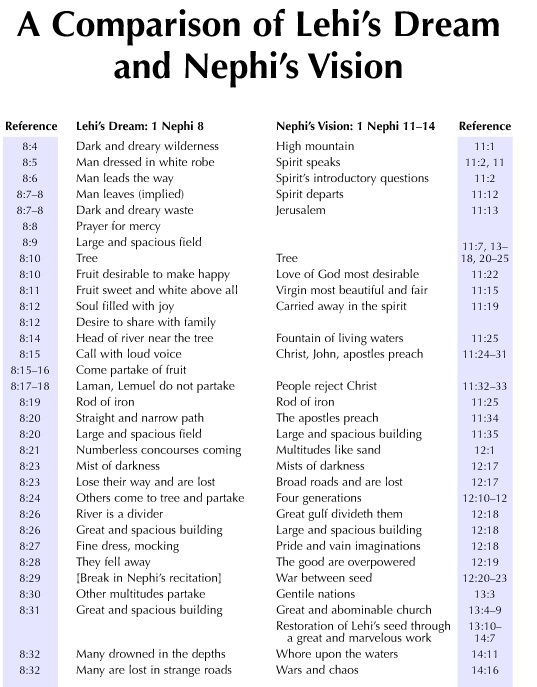 But Lehi's vision is recorded as being completely allegorical, while Nephi's vision of the tree of life expanded further into a view of the future of the world and Nephi's posterity, including specific historical occurrences like the birth of Jesus Christ and the latter-day restoration of the gospel to Lehi's seed. On this chart the elements in these visions are compared and contrasted. Viewing these two texts together may yield new insights concerning both of these visions of the tree of life.